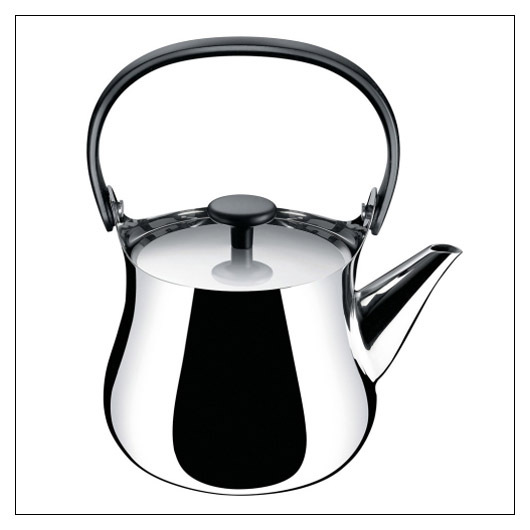 Alessi Cha Kettle/Teapot (ALKETCHA) at Pure Design / Accessories / Kitchen ::: Furniture for the Home, Office, Home Office, and More at Pure Design Online! Naoto Fukasawa's characteristic minimalist rigour is present with "Cha", a refined object that is both a Kettle and a Teapot, thanks to it's structural detail. "Cha" - from the Japanese word for tea - is fitted with a large and elegant filter for the tea leaves. Tabs on inside lip of lid create a tight fit to prevent lid from falling off while pouring.